Microsoft CEO Steve Ballmer announced a reorganization of the company -- but he has been down this road many times before. The shakeup, which Microsoft (MSFT) announced Thursday, is intended to better align the company's organizational structure with its new corporate strategy. CEO Steve Ballmer declared in October 2012 that Microsoft would transition to a "devices and services" company, focusing on making hardware, online services and apps that work together seamlessly across multiple screens and gadgets. "The form of delivery of our value will shift to really thinking about devices and services versus packaged software, but the focus in on the high-value activities in people's lives will not change" Ballmer told analysts on a conference call Thursday. 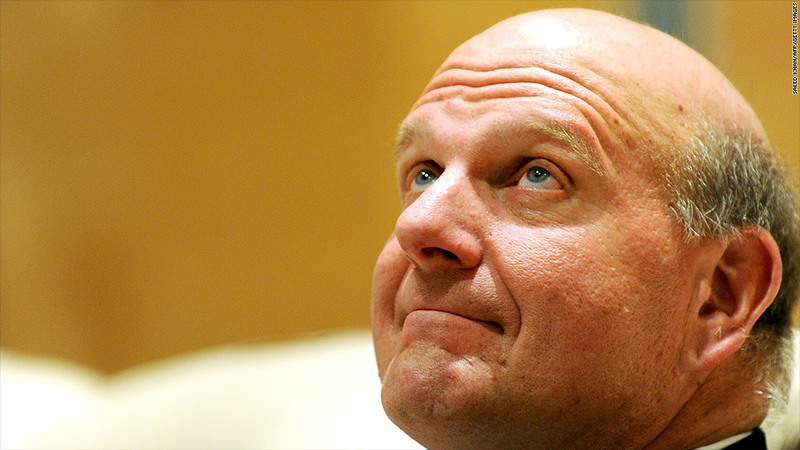 Ballmer said Microsoft had "no plan for layoffs" as part of the reorganization. The new strategy, called "One Microsoft," will "enable more cross-group contribution," according to a memo Ballmer sent around to his staff. "We have to be more like a football team -- that is, we all play a specific position, and we run every play together -- than we do like a baseball team, where athletes are often times more individual in their orientation," Ballmer told analysts Thursday. That has long been a problem for the company. Insiders say the corporate culture has traditionally been so competitive that collaboration with other teams has been discouraged. Microsoft will hold a conference call at 12:30 p.m. PT to discuss the plan in more detail. "Times change, and Microsoft has to change with it," said Al Hilwa, an analyst at IDC. "They are generally executing on the outlines of the right strategy, but speed of execution and responsiveness is their biggest issue right now. The new organization is likely focused on exactly that." Yet Microsoft has tried this kind of thing many times before. And last year, Microsoft shuffled its marketing business. If reorganizations sound like they're part of Microsoft's culture, that's because they have been for decades. "We changed the structure of the company," announced then-CEO Bill Gates in a 1996 post on Microsoft's website. "I'm sure we'll change it again many times. Reorganizations are expected around Microsoft." Gates noted that the company had undertaken a major reorganization every two years up to that point. But as many times as Microsoft has changed things up, the reorganizations haven't sparked major growth. Earnings and sales have largely grown at a steady pace, and Microsoft's stock price has been stuck between $25 and $35 for more than a decade. "Again?!" Laura DiDio, principal analyst at ITIC, said in response to the re-org. "These constant reorganizations have done little to jumpstart the company's business or have an impact on its bottom line." Though reorganizations are simply a part of corporate life -- particularly at companies as large as Microsoft -- these countless strategy shifts have taken a major toll on morale and productivity, former employees have said. "When we got reorganized, the first thing the new management wanted to look at is what we've been doing, and then they'd immediately hit the reset button," said Bobby Gill, a former project manager within Microsoft's Forefront Identity Manager group, and co-founder of Blue Label Labs. "You end up revisiting everything, and it just becomes an endless reset process." Gill said his division went through three major reorganizations during his four-year tenure at the company, which lasted between 2005 and 2009. At one point, his team was well into the development of its product when new management came in and threw out all the plans for the project -- only to approve the same exact plan more than a year later. The cost of constant shuffling, he said, was "planning paralysis." Another fallout from all the management changes is that rising-star executives at the company have often been fired or quit as a result of the shakeups. Numerous heir-apparents to Ballmer, including Ray Ozzie, Bob Muglia, Steve Sinofsky and Craig Mundie have left over the past several years -- and not always on the best of terms. So as Ballmer solidifies his leadership of Microsoft by instituting his latest vision, the short-term plans for the company become clearer, but the long-term outlook perhaps becomes even cloudier. "As long as Ballmer wants to hang onto the position, there will be very little substantive change," DiDio said. "And yes, many financial industry analysts and shareholders feel that is a big problem."